​Do you feel a sense of dread and despair in dealing with your clutter? Does it lurk in dark drawers or sprawl over any flat surface? Have you tried other programs, books, or sheer will power without achieving the results you want? ​We have a different approach - and it works! Using Kaizen principles and creativity tools we help you find a way to keep your clutter at bay! Clutter comes in many forms and is often the result of unresolved decisions. We know about clutter because we have clutter too. And we know about clearing clutter - because we found an approach that works for us. Now we would like to share it with you. Our approach lets you shift your perceptions about clutter and provides a method for building a gentle and sustainable momentum for clearing your clutter—one that helps make the process easier, less stressful, and, yes, (drumroll, please), even fun! At only $89 for 4 weeks, it's an opportunity you can't afford to miss! 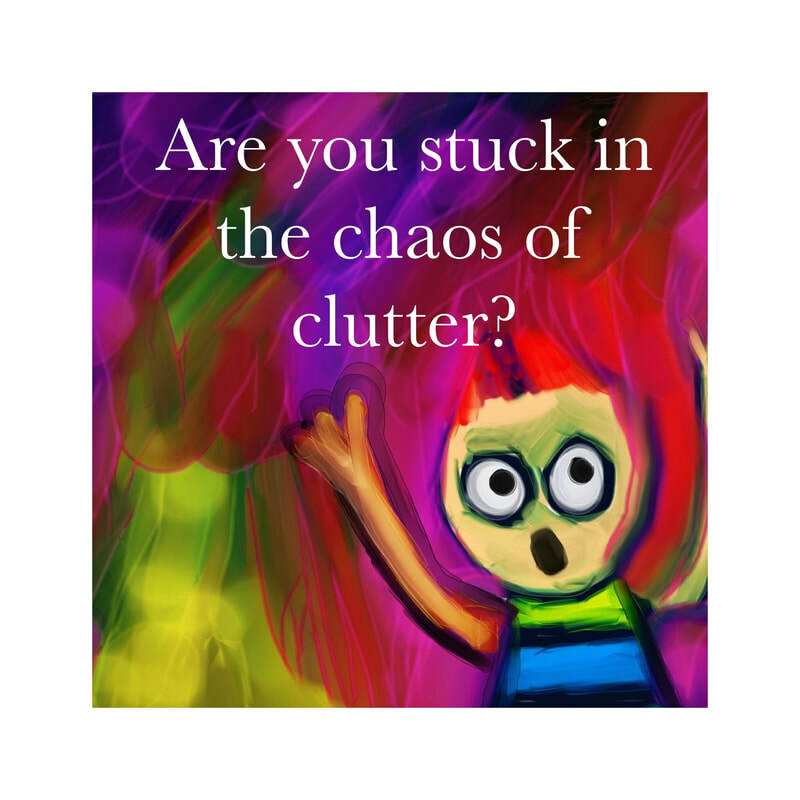 Reduce the clutter in your life, but don't know where or how to start? Understand why you have clutter, and gently change your relationship with it? Focus on one (or several) of your personal clutter ‘favorites’? Find support, systems and strategies that work for you? Build sustainable momentum towards clearing your clutter? Have more time and energy for the things that matter most to you​? If you answered yes to one or more of the above questions then Creative Clutter Clearing: a KMI Master Mind™ is for you! I enjoyed exploring my need for some of my belongings, and my appreciation for those same items. I loved connecting with the group and sharing what we go through, the way clutter is defined a little differently by each of us, and how it affects us all differently. I’m looking at things around me with new eyes—with much-increased awareness. Is it useful? Does it give me pleasure? Does it work? Does it make sense to hold onto this item? This Master Mind brought a softer, non-judgmental perspective on clutter, gave gentle nudges to come up with small steps to get started, and built momentum. If you have clutter issues, this is the place to come! Your cost is just $89 for 4 - ninety minute KMI Master Minds™. Includes time on each call to start clearing your clutter! Why a Master Mind? and What is KMI? A KMI Master Mind™ is NOT A COURSE. Each master mind is unique and with customized content based on the needs and interests of its members. A master mind provides the perfect opportunity to dive deep into a topic, an issue or problem with the collaborative support of a group you will gain multiple perspectives, have access to new resources, tools and ideas to help you determine your next small action step. A KMI Master Mind is a Kaisen-Muse™ Infused (KMI) Master Mind™. This means that is it uses the gentle but powerful building blocks of Kaizen (tiny thoughts, curious questions, small steps and relevant rewards) and is filled with creativity and purposeful, playful productivity. This particular model has the feel of a circle with the power of a focused master mind that creates sustainable momentum towards your goals - in this instance, for getting your clutter cleared. Thanks to the KMI Master Mind™, I’m more aware of why I’m cluttering, and thus have developed more compassion for myself around this issue. I really benefitted from the group support, the new tools, and the accountability for doing some decluttering each week. I’ve definitely made inroads in dealing with my clutter. Since this master mind was so helpful to me, I’d absolutely recommend it to others! More time and energy to spend on what matters most to you! The KMI Master Mind™ helped me in several ways. It increased my subconscious awareness of the clutter in my life—I am seeing things that I hadn’t noticed before, even though I’m not actively looking for them. I'm looking at my clutter control strategy in a new way. I don't hide clutter anymore. I'm now taking possession of my possessions and am focusing on what I really value rather than what I want to cling to. It's as good as it sounds! And at $89 it's a steal! Hi, I'm Mary McDowall, one of the creators and facilitators of the Creative Clutter Clearing: a KMI Master Mind™. I have been developing and facilitating workshops and trainings for over 30 years, and my love for unique ideas and building connections has helped to shape this powerful yet gentle Kaizen-based, creativity-infused clutter clearing experience. Hi, I'm Donna Mills, co-creator and co-facilitator of Creative Clutter Clearing: a KMI Master Mind™. If you have any doubt that clutter is a major challenge for many folks, just check out the self-help section of any bookstore. Perhaps, like us, you have tried other programs and techniques to rid yourself of clutter—programs that told you that "if you just do it this way," your clutter will magically and permanently melt away. If you are reading this, chances are those ‘one size fits all’ programs didn't work for you, either. The result of that quest was Creative Clutter Clearing: a KMI Master Mind™, which combines creativity and group support with the Kaizen approach of small steps to big results. Because clutter isn't just about having too much stuff! It’s about your relationships, your stories and your history. Are you ready to have you join us? KMI Master Minds™ are different. They provide all the wonderful benefits of traditional master minds, with the addition of oodles of creativity and the Kaizen approach. This includes focusing on the process of clutter clearing and taking action steps during each session. Think of clutter clearing as your project or your business. You will have breakthroughs you will be excited to share, and you will have road bumps to navigate with the support and help of your fellow members. Each Master Mind is 90 minutes long. During that time, you will be taking small actions on your clutter clearing project. If that is all you want to do, that’s fine. Your time commitment can run the gamut--from the 90-minute Master Mind session only, to any extra minutes or hours you’d like to devote to clearing your clutter between sessions. The Master Mind sessions will take place on a video conferencing platform called Zoom. You can access Zoom via computer/laptop, tablet, or mobile device. You just need to download and install a free piece of software. If you don’t want to videoconference, you can also call into the session via telephone although you may incur long distance charges.